I couldn’t help but express dismay at a sign at the establishment next door to the restaurant I visited. The permanent sign for this car wash had a marquee area for a changeable message. What was the all-important message displayed that day? “Car wash”. That’s right. Someone at the car wash hauled a boxful of letters up a ladder to repeat exactly the same thing and ONLY the same thing that the permanent sign already made pretty clear. I wish I knew why. It wouldn’t have taken much to improve on this scant message. Including a price point might have helped, touting “Better Car Wash” (or even “WORST Car Wash”) might have gotten better responses - or at least generated some interest. I’ve got three magic words that might have elicited a smile when seeing that sign: “Workin’ at the...” If new decisions can only be made when new information is offered, how is your company offering that new information? Are you wasting space in your ads, on your signage, or in the minds of your customers? Are you saying something compelling in a unique way? Are you entertaining, engaging, enraging, or are you simply parroting the obvious? While the car wash sign is wasted space, I caught sight of a great example of a blind spot closer to home the other day. This “Lost Cat” sign has been posted in my neighborhood for a while. Okay, it’s not paid advertising, but the same rules of persuasion still apply, so let’s take a closer look at the message. 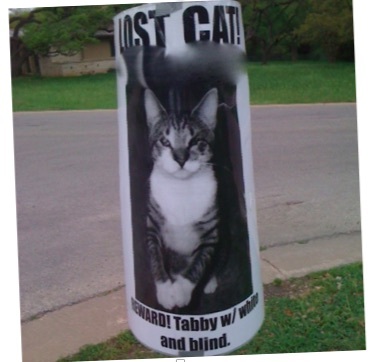 “Lost Cat …the phone number (which I’ve blocked out) REWARD! Tabby with white and blind.” Wait, WHAT? Blind? A blind cat?! This cute little guy is out there alone, sightless? Talk about burying the lead! It took me about 11 views before I really saw the “blind” portion of the sign. Why? It comes after “white” in the description. What goes with “white?” Uh-huh. The first 10 times I saw the sign fluttering against metal stop signs and phone poles, my brain filled in “with white and blind” with “white and black.” In fact for a few days, I clucked at the thought that they ran out of room to say “with white and black SPOTS.” Why didn’t they say “Lost BLIND Cat”? Not enough room at the top? Fine. Even dropping the word “Lost” and focusing on the more important word “Blind” with the cat’s photo, and I think we can make the mental leap that the kitty isn’t wanted for embezzlement or anything, it’s lost! The neighborhood might have rallied around the furry little fella much sooner, with or without the reward. I’m sorry to report, I don’t think he’s been found, and we might have bad messaging partly to blame for the delay. Clarity of your message doesn’t require greater explanation. It may not need a full page in the newspaper or a :60 radio ad. If you have just a few words, make those words count, particularly if you’re marketing to anyone in a passing car! Be clear about what you want the person on the other side to do next: “Clean cars go faster.” “Blind cat needs help!” Need help finding the blind spots? Want something more intriguing instead of wasted space? Contact a Wizard of Ads Partner such as myself, to find out about more persuasive communication. And if you see a blind cat bumping into trees in the West Lake Hills area, take him in and call me! I want to make sure he gets a better home. The bag of candy was plopped in front of me as though it were a challenge – not of health goals, mind you, but I had introduced myself as a Marketing Professional to the gentleman I was interviewing. (I assured him I wasn’t there to sell him anything. I was just looking for his input as the owner of a small business for a book the Wizard of Ads Partners are working on. ) “Oh, here’s something someone dropped by today,” he noted as he pushed the bag forward on the desk between us. It was an ordinary sandwich bag with a twist tie at the top. Inside were several “fun-size” Kit-Kat bars and a piece of cardboard with the address of a nearby Liberty Tax Service printed on it. “I thought it was cute,” he said, although he didn’t sound the least bit amused. I asked, “Have you switched tax preparation services because of it?” “No.” “Then I’m not impressed by its effectiveness.” We moved our attention back to the questionnaire, but I glanced back at the bag a few more times. Finally, I had to speak up. “What bugs me the most about this is that there’s no clear image. No mental association!” He invited me to continue. “There’s nothing to link the bag of candy with the advantage of getting your taxes done by Liberty Tax Service.. 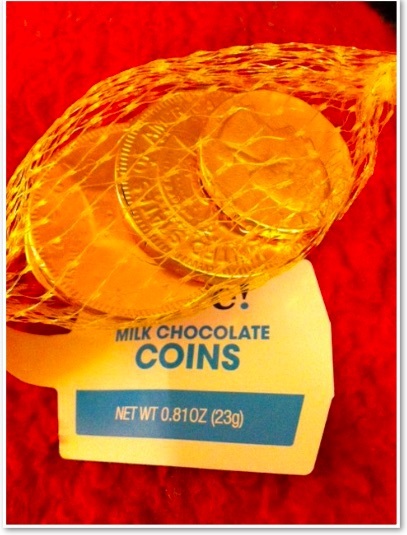 If they had put chocolate coins in the bag instead of Kit-Kat – or PayDay or $100 Grand – and not the fun-size either, but big generous candy bars – anything that associates them with money. But let’s stick to Kit-Kat. Their slogan is ‘Give me a break’, like getting a tax break. ‘Let Liberty give you a break this tax season.’ But they didn’t go there either. If they had connected the sweetness of candy with the pleasure of a bigger refund or the ease of using Liberty Tax Service, that would have helped. But, of course, even that has to be backed somehow by facts. If you can take the cardboard insert advertising Liberty out of the bag and put anyone else’s ad in there instead, that indicates that it’s not the strongest message you could go with. Unless you can ‘own’ it – declare it with confidence, and have the gumption to back it, it’s just talk, right?” “Mental association…” was all the business owner could say. “Yes,” I insisted. “There is no mental image here, good, bad or otherwise, connecting this bag of Kit-Kats with taxes, tax preparation, liberty or Liberty Tax Service!” The business owner peered inside the bag as though I scrutinized it as a crystal ball and saw far more in it than he. “Who’d you say you were again?” I smiled. “I’m part of a collection of marketing consultants who turn words into magic and dreamers into millionaires.” I rose and put on my coat. “Thanks for the answers to these questions. When the book comes out, we’ll send you a copy free of charge.” I’m sure he was waiting for the sales pitch that never came. I hope I left him food for thought more satisfying than that bag of candy. When choosing any sort of marketing avenue, ask yourself when you start down that road: * Does this marketing reflect my business in a positive light, or does it come across as cheap and ineffective? * Does it say something useful, surprising and memorable? * How “disposable” or seasonal is the message, and is there a plan to replace it with something fresh and timely after this? * The shorter time you have to reach out and connect, the more powerful your message must be. Part of that power is its relatability. * Don’t lull yourself into believing that your business is seasonal. People looking for a new tax service this year are doing so because of dissatisfaction felt from something they experienced a year ago! Ready for success this year and beyond? Might I suggest the Wizard of Ads Partners. But fair warning: we offer NO QUICK FIXES, NO PLACATING, and NO CHEAP BAGS OF CANDY. I was recently asked to rewrite some ads that the client’s local university had written and produced. They were … interesting. No, why sugarcoat it? They were lumps of crap filled with ineffective humor, inaccurate information, bad characterizations and unlicensed music. (Other than THAT, Mrs. Lincoln...) Three of the four spots were SO inaccurate as to what the client offered, he could not even run them, and the fourth one was so neutered of relevancy or credibility, it was 30 seconds of my life I wished I had back again. I asked the client what he wanted to get across in these ads; something I would have hoped the University station would have asked before beginning. He gave me a few bullet points to emphasize as well as a pretty strong offer that was missing from all of the University’s spots. I wrote three thirty-second ads and sent the scripts to the client for his approval, making sure that when characters or music genres were used that I was clear as possible. I wanted the client to be able to decipher the content and the drama in the ads in his head. This step is often bypassed by bonehead beginners who believe that the client can’t possibly imagine how GOOD the ad will sound, unless it’s fully produced and presented as though the client were the average radio listener. Copywriters and Production Directors who believe that are living in a dreamworld. I know this! I come by it honest, because I used to BE one of them! This is a fiction perpetuated by films and TV shows dating probably all the way back to Darren Stevens on Bewitched who would constantly dazzle clients with a fully produced pitch. But here’s the awful truth: the client is already biased! Reality Lesson #1: Never expect the client to put themselves in the position of the ordinary radio listener. The client is listening for their name, how many times their phone number is in the ad, did I mention how long they’ve been in business, blah, blah, woof, woof. Reality Lesson #2: On that first listen, the client will not appreciate the clever dialogue or the carefully chosen acoustic blend of music and all the other ingredients that went into that production. Why? See Reality Lesson #1. Reality Lesson #3: Start with the most important basics: present the script, and BEFORE you waste a lot of time jumping through production hoops, get the script approved FIRST. Had the University station done this rather than “surprise” the client with their fully produced affronts, the client would have had the chance to set them straight, saying, “Actually, we don’t DO that, we CAN’T offer that, and that’s downright ILLEGAL in our industry!” Going to the University’s website, I noted they had a pdf of “Underwriting Guidelines” for people who wanted to “contribute to” the student station. (See, it’s not advertising. It’s a tax deductible contribution! Plus, advertising is bad, m’kay?) The pdf also offered some information about the station. * The student run radio station located on the campus is a great way to create interest and brand awareness throughout the area. * We provide a versatile audience with listeners ranging in age and interest. Each day of the week different music genres are played that invite different listeners. * Each radio package includes a thirty second radio spot ran 7 times a day 7 days a week. * Each business will be assigned a student worker to produce a creative radio spot, free of charge. Wait! My client is supposed to build brand awareness on a station that changes format every day? Oooohhh-kay. And then there’s that last line: “a student worker to produce a creative radio spot free of charge. Well, my client certainly got what he paid for. He got “creative!” Just not “effective!” Then there are the Underwriting Guidelines for businesses: (This is an exact transcript from the University’s site, grammar mistakes and all.) Remember Underwriting causes listeners to have a higher regard for noncommercial underwriters than for advertisers on commercial stations that may appear to be solely interested in peddling products. Also-noncommercial stations are void of the clutter that is found on many commercial stations. Be creative and incorporate dialogue, drama, storytelling into you message. The pdf goes on to warn the Underwriter, “Don't include a call to action.” To be fair to the University station, yeah, I get it. You don’t want the messages on your station to sound like ads. But, guess what? The ones I heard DO sound like ads. Just really exceptionally ineffective confusing ads. 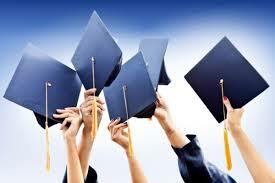 So what exactly are you teaching your students about marketing? Time for some straight talk, University Media Faculty. Look, you cannot teach your students squat about how to effectively help businesses succeed through advertising if you look down your noses at commercial media and you teach them to do the same. You speak of advertisers on commercial stations “that may appear to be solely interested in peddling products.” YEAH! No “may appear” about it: that’s pretty much the purpose of advertising! Believe me, listeners will NOT have a higher regard for noncommercial underwriters if the spots produced are as poorly written and horribly produced as the ones I was asked to fix. As for you students, you’re given the directive to “Be creative”? May I suggest: First, be interested in the underwriter. Be inquisitive. Be informative. Be relevant. Be credible. Only then can you hope to be effective. Effective = happier clients, and you don’t have to begrudge listeners to accomplish that. If you need an outlet to use whacky voices and go crazy, start a podcast or join an improv group . Maybe you’ll get a job on the Morning Zoo. But just so you know, your genius will be interrupted on a regular basis by paid advertisers peddling products. I hope you haven’t been taught to be offended by that. It’s kinda how the real world operates! Her voice is low in volume, lyrical in tempo. My dad and I were visiting the Butterfly Encounter is Key West, and after buying tickets, we gathered near the exhibit's entryway. Our ticket-seller drew us in with her quiet speech and instructions. Her manner was that of a kindergarten teacher as she softly warned us that before exiting the exhibit, that we use the mirrors in the little room just before we leave to be sure we don't inadvertently take any of their butterflies with us. Once we entered the enclosed garden and wondered at their meandering paths with its strutting flamingos and floating, flitting technicolor butterflies, only then did I appreciate the ticket-seller's subdued set-up. She was preparing us for the magical menagerie we were about to encounter. Imagine if she had more of a carnival-barker approach. What a disconnect that would have been! Right off the bat though, the colors, brightness, soothing nature sounds and soft music of the gift-shop and spoken delivery of our hostess set our expectations of the world we were about to visit. In the world of business, we are continually setting customer expectations with every point of contact. We create expectations. We build a universe. Take in the photo up top: It is from a project I am producing that will debut on Easter Sunday, 2019, called The Journey From Emmaus. 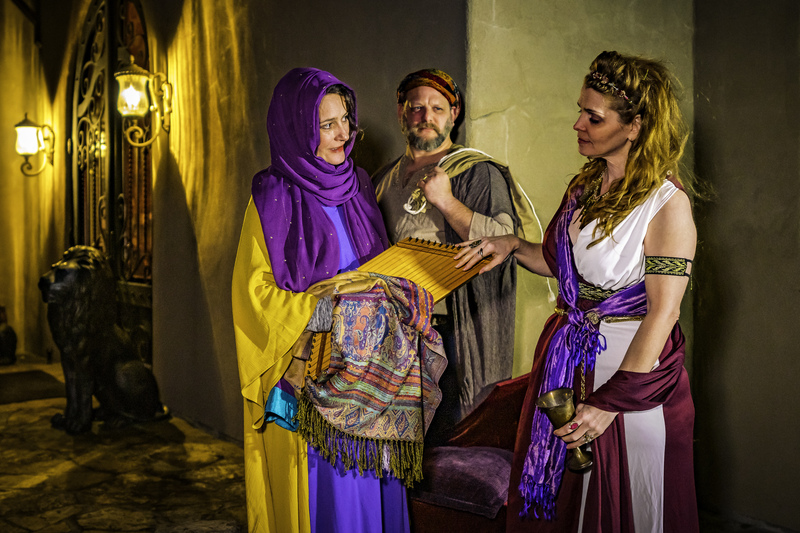 In this photograph, Cleopus and his wife Yoanna encounter Claudia, the wife of Pontious Pilate. The saturated colors are reminiscent of stained glass. The couple are strangers to the opulence of Romans. Their interactions are tenuous. One thing the women have in common is the psaltry harp that Yoanna carries. Cleopus looks on, keeping his distance from Claudia. The composition, lighting, costumes, props and attitudes of the actors all help to tell a story and bring you into the universe of Biblical times. It sets mood, it gives you subtext, and draws you in. Theme parks, gaming companies, event organizers, restaurants, and resorts know the importance of building a compelling universe. What sort of universe are you building through your website ...your storefront... your employees ... your displays ...your signage? Need help telling your story, setting your mood, or getting customers to engage and remain interested in what you have to offer? Let me help you build, sustain and maintain your universe. Contact me directly here: monica.ballard@wizardofads.com.